One week to the day before they meet in La Bombonera in the first competitive superclásico of the year, River Plate and Boca Juniors had very different weekends in the 2011 Torneo Clausura. River, needing a win to keep up the pressure on Vélez Sarsfield at the top of the Clausura, and also to gain a bit of breathing space at the bottom of the relegation promedio, slipped up at home to relegation rivals All Boys, who got a 2-0 win. 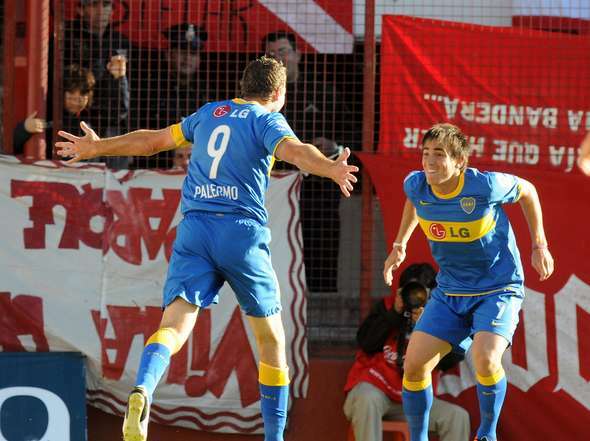 Boca, meanwhile, with goals from their two legends Martín Palermo and Juan Román Riquelme, won 2-0 away to Argentinos Juniors. The day’s other two matches were both draws; Lanús and Estudiantes drew 0-0, and Independiente and San Lorenzo, in the weekend’s clásico, drew 1-1 in Avellaneda. All the goals are right here. Nice piece on Lamela Sam, but I would say that he looks alot more like Bambi than does Ronaldo. He might actually have to cut those eyelashes. He’s just a little too purty.